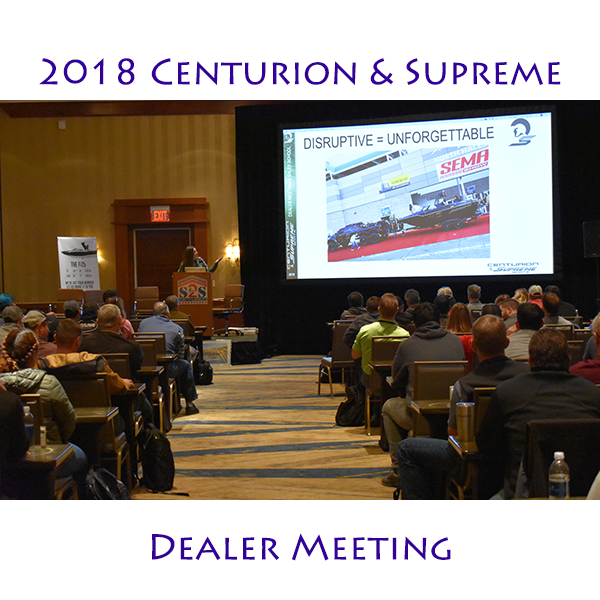 MERCED, CA (December 3, 2018) – Centurion Supreme Boats held their annual Dealer Meeting and Sales School November 11-13. Dealers were invited to the spectacular Horseshoe Bay Resort in Austin, TX to learn about the unforgettable 2019 Centurion and Supreme boat lineup and participate in sales training. In total there were 51 dealerships, 207 attendees, 13 Brand Ambassadors and four athletes that participated. This was double the attendance of previous year thanks in large part to the addition of more than 30 new dealers and a more than 60% increase in Centurion retail sales year over year. The meeting kicked off with a meet and greet hosted by Extreme Trailers that set the stage for the goals of the meeting: to educate and empower the Centurion Supreme Boats Dealer Network. The Centurion Supreme Team hosted classes to educate dealers about each brand and boat model with its 2019 marketing initiatives. Sam Dantzer, from Garbage Composites, presented a speech on how to grow your Centurion Supreme Boats Dealership. Dealers even had the opportunity to run the 2019 Centurion Supreme boats on the water. Dealers, vendors, and the Centurion Supreme staff strengthened business relationships and developed comradery during the event. Attendees participated in a toy boat building and pool racing competition for a team building challenge hosted by Gatorstep/Canby. During the last day of the meeting, Centurion & Supreme Boats honored their highest performing dealers at the 2018 Awards Dinner. Singer shared the brands’ vision for 2019, while recognizing the Centurion Supreme Family for their amazing successes this year. He also introduced the President and CEO of Correct Craft, Bill Yeargin, to speak on the state of the industry and Correct Craft’s role as one of the most innovative companies. Dinner and awards were hosted by Veralex, Roswell Marine, Belter Insurance and LotVantage. Dan-O-the-Mano presented the 2018 Centurion & Supreme Dealer Awards recognizing the remarkable sales, marketing, customer service and charitable achievements of the past year. We congratulate the award recipients listed below.